As a point of interest, when I was trying to come up with an idea for my own story, I decided to do a little research on the picture itself. 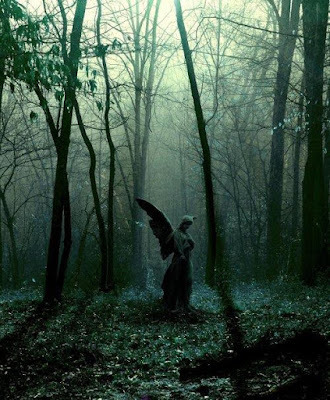 It’s called, Forest Angel of the Ozarks, Missouri. Pretty much every hit on the Google search led me to another version of the same picture. There doesn’t seem to be any other information, other than it truly does exist. I’m not sure if enjoy is the proper word to use for this story, but it’s certainly very appropriate based on current events, and even though we’re both Canadians, the scary part for me is I could actually picture something like this happening. “Let him wait,” said Stuart, to his son’s retreating back. Knowing he had an obligation to those trusting him to protect them, he picked up the file from the table, walked into his office and started to make the calls. Four hours later everyone on the list was safely inside the bunker. Before securing the heavy steel door, Stuart looked around, praying his son had come to his senses and would arrive. The sound of gunfire startled him and he took a step inside but still held the door open. Lloyd stood at his friend’s shoulder helping to scan the forest. A bomb blew up some factories in town shaking the ground under their feet. The smell of gunpowder floated through the trees, sticking to their clothing but still, they watched and hoped. “It’s time,” said Stuart, pulling on the door. “Let me,” said Lloyd, reaching to help. Five hours later the news reported more rioting in North Carolina, Tennessee and Kentucky. The National Guard had been called out but the army the Confederates had miraculously pulled together wasn’t being contained. The race wars had returned. The bunker shook as another bomb detonated near by but other than a few of the ceiling lamps swaying everyone was safe inside. Outside the landscape was being pock marked by bombs and riddled with dead bodies as the two sides fought for dominance. History was repeating itself. When things finally calmed down on the surface, Stuart led the people from the bunker out into the sunshine. They stood silently, taking in all the carnage and wasted lives of those who hadn’t believed that history would repeat itself. Over the following weeks the people from the bunker rebuilt their homes and lives. They accepted strangers into their small town and helped each other heal. None of them forgot the sacrifice Stuart had made and on the day that would have been Malcolm’s birthday, they all gathered and erected a stone angel on the spot he’d died. My own story (as you might expect) is a little more out there. The idea for it came when I was sending my buddy Jamie her daily quote email. I was talking about coming up short for ideas and I was going to facetiously suggest I write one based on the villains from one of my favourite television shows and suddenly it clicked - and I had my idea. Hey! I guess technically this is my very first piece of fan fiction. I have been here for a thousand years, and if I must I will be here for a thousand more. Waiting. Longing. Dormant. It has been too long since I fed. Some called us the lonely assassins. Most called us monsters. I suppose this is true for we were born of the union between the medusas and the basilisks. But I tell you plainly, we are not evil. We are not motivated by cruelty or greed, the evil that we are accused of is merely our desire to survive. To feed. We have been here since the dawn of time and we will still be here when time runs down. We are everywhere, maybe even in your own back yard. For we are cunning and patient. But we have no conscience and no emotions. We have no need of them. You will never see us in our true form. When you glance our way we assume the form you see me in now, that of a stone angel. This is the form we take our prey in. A single touch is all we need to extract the life essence of our food. Our form was not always that of an angel, but it is the one we are most comfortable in. It seems soothing to our prey, at least until we are ready to attack and our claws and fangs appear. Their fear adds flavour to our sustenance. Unobserved we can move with incredible speed. It is only when our prey is looking that we take on the appearance of harmless stone. As long as they are looking we cannot move. It’s only once they look away that we are free to act. Our prey does not die, as such. With a touch we send them back to a time before their birth and then feed on the energy that remains of what would have been their life. Our prey is helpless in our presence. Weapons cannot kill us and we possess the ability to reform if we are destroyed. When hunting in groups we must take care. Should we accidentally look at each other we would become locked in place forever. I have even heard of instances where a group of us on a hunt accidentally exchanged glances and remained frozen in place until they starved to death. For this reason when we are in groups we often cover our faces with our hands, giving the appearance that we are weeping. Our numbers do not change much. We do not procreate in the sense humans do. First of all, we have no emotions so there is no love or desire, and though we look human we are not. We are unable to perform the physical act of love. Should the need to procreate arise, we can use our magic to give life to other, lesser statues. I am the sole survivor of this place. We came here eons ago, and fed until there was nothing left. A glance towards one of my fellows was all it took and we were frozen in place. The others moved on, leaving us behind. As the ages passed my companion starved to death, and I was left too weak to move.